John Ebinger performs the Double Bass works of Frank Proto, 'a serious composer of substantial invention', with Roy Hakes on piano. John Ebinger is a native of New Mexico and has been a member of The Phoenix Symphony since 1995. He holds a bachelor's of music degree from New Mexico State University, and a master's of music and doctor of musical arts degree from Arizona State University. Ebinger has performed with the New Mexico, El Paso, Tucson and Hawaii symphonies. He also has performed nationally and abroad in summer festivals such as the Flagstaff Festival of the Arts, Great Music West, Music in the Mountains and the Spoleto Festival. 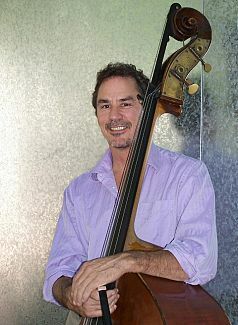 Ebinger's first solo album, "The Doublebass Music of Frank Proto," was released by Soundset Records in the fall of 1996. John Ebinger is a native of New Mexico and is currently a member of the Phoenix Symphony Orchestra. He holds an undergraduate degree from New Mexico State University, and a Master of Music and Doctor of Musical Arts Degree from Arizona State University. He has performed with the New Mexico Symphony, The Tucson Symphony, and the Hawaii Symphony. Dr. Ebinger has also performed nationally and abroad in summer festivals such as the Flagstaff Festival of the Arts, Great Music West, and the Spoleto Festival.on the Arts. "Proto is an American composer unfairly pigeonholed as a pops arranger. Ebinger's disc shows him to be a serious composer of substantial invention". "To write for the double bass as a solo instrument is a tricky business. The ultralow sound tends to disappear behind accompaniment. Proto, once a professional bassist himself, shows in two scores for bass with piano that he knows the tricks required to keep the bass out front".